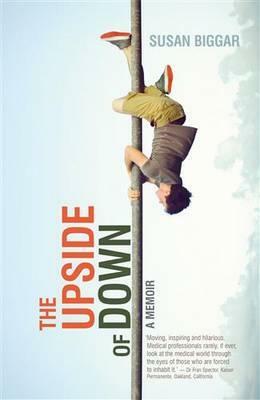 In Melbourne on Sunday 31st August Susan Biggar launched her new book The Upside Of Down. For those of you not familiar with Susan, she is the chair of the Royal Melbourne Children’s Hospital Family Advisory Committee. Susan together with her colleague Dr Catherine Crock and several other committed medical professionals, formed the Australian Institute for Patient & Family Centred Care [AIPFCC] which focuses on and supports a patient centred model of care. Susan also writes about health and healthcare, cystic fibrosis, parenting, politics and culture. She is a regular contributor to the CF world both in word and print. I devoured the book over the weekend and it’s a book every CF parent and health professional should read. Susan has two boys with CF and her insight into CF health and the healthcare system that supports it, told with humor and empathy from CF centres around the globe is a wonderfully uplifting tale about responding to what life throws at you and keeping your eye on the prize no matter what. I fell in love with a New Zealander. I don’t know what I was thinking really. After some linguistic chaos and country-hopping we settled down to have a family inNew Zealand. Then one day I found a letter on my newborn son’s incubator telling me this perfect baby had cystic fibrosis and would be lucky to live to thirty. My laid-back Kiwi husband took this news like it was a diagnosis of a cowlick. I tried to be a brave Californian and was generally fine until someone said something overly nice to me, like ‘Hello.’ Eventually I adjusted to sharing my life with a life-threatening lung condition and began doing Aidan’s daily physiotherapy, pounding his chest as though whacking a ketchup bottle, tipping it upside down to get the last dregs to slide off. I also slipped him dozens of pills a day, like feeding coins into a slot machine. After some major emotional ups and downs in New Zealand, a job offer in France dropped into our lives like a rescue helicopter. We grabbed hold and flew into the fascinating and romantic adventure of Paris. Now the fringe benefits of life in that city are unbeatable. But if you need to shop, drive, set up a telephone line or become a frequent flyer at a hospital, Paris is an absolute pain in the derrière. Not to mention that everyone speaks French, which I somehow forgot to learn. My relationship with the French doctors began badly when I managed to turn up pregnant with another baby with CF and then we decided to continue the pregnancy despite our clever doctors telling us that was a dimwit idea. Over five years in Paris things improved. Our gentle giant physiotherapist, Jean-Pierre, nearly moved in with us as part of the family ‘stay-healthy’ campaign and despite unexpectedly doing a tour of hospitals in Normandy, Cannes, San Francisco and Auckland with our two young sons, Aidan and Oliver, we were happy. However, while almost earning an honorary doctorate in healthcare I began to question the lack of family involvement and empowerment in decisions and day-to-day care. This didn’t go down too well in France where the doctors were apoplectic when I pulled out a page of questions for them, like quizzing the Pope on the catechism. Ultimately a longing for space, clean air and family-centered healthcare drew us to Australia which turned out to be uncomplicated and oddly friendly. I made a brief pit stop in Auckland to have another baby before reincarnating myself again for a new life in Melbourne. The sporty, relaxed Aussie way suited me perfectly, though the crazily health-conscious teachers did struggle to understand Aidan and Oliver’s high fat and high salt CF diet; by their reaction, you’d think that a square of chocolate in the lunchbox was on a par with lacing the kids’ brownies with LSD. After reading a game-changing article about cystic fibrosis I became passionate about quality healthcare and exercise for our still-healthy kids. Over time—and thousands of hours—this led to changes in the way care was delivered in Australia. The pressures of life and illness weighed down my marriage and for a time it swayed in the balance before I found new love in that old relationship. And as our family took up running and sports with enthusiasm I watched my sons skip their way into adolescence and surpass all expectations: competing in the state cross-country, track, swimming and surf lifesaving finals all in one year. This is a story of belief, a story about learning that sometimes joy is a decision. The Upside of Down is a memoir about illness, yes, but it’s also about the reward and frustration of parenting, the hard work of resurrecting a marriage and the upheaval of cross-cultural life. This book celebrates today because we can’t always count on tomorrow.